It has been about a year and a half since my last visit and in keeping with the themes we discussed during dinner, I am going to start with the food then go into the rest of the experience. This dish consisted of summer vegetables, vinegar, and shrimp. The vegetable has a long shape with rounded ends and what looked like some sort of transparent semi-liquid cover. The overall effect was a very liquidy dish that when you bit down yielded a surprising crunch and a burst of flavor. The flavor is quite unique, I am hard-pressed to describe it but I'd call it a bitter, smoky, vegetal flavor. I think I had this at Kyubei in Japan which was even bolder and more intense and I prefer Urasawa's version. 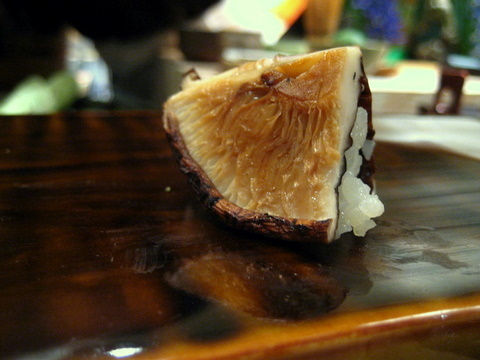 For our second vegetable course we were served raw eggplant from Osaka with soy. 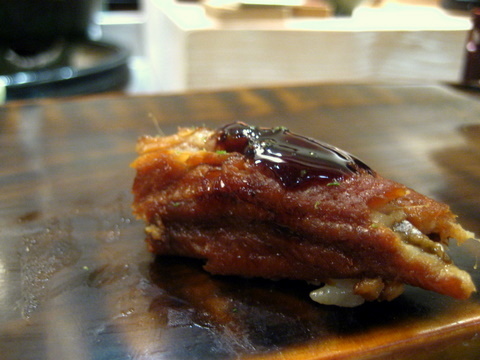 The eggplant had a very mild flavor on its own, just the barest hint of sweetness which the soy accented beautifully. The texture is a bit hard to describe, the eggplant is porous but fairly dense, just hard enough to give a bit of crunch when bitten into. 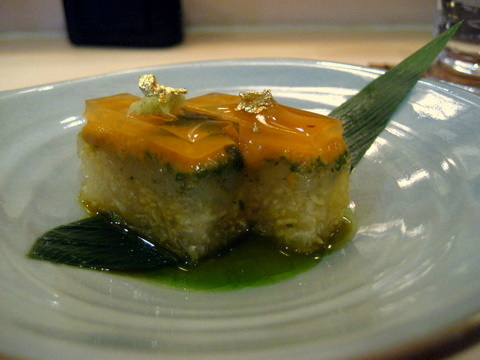 This layered dish combined, uni, small sweet shrimp, grated mountain yam, gelatin which I think was also made from the yam and a bit of wasabi and gold leaf on top. I cannot say enough about this dish. The pieces fairly quivered as I picked them up with my chopsticks. The flavor of the uni was muted adding a light brine which underscored the whole dish but let the other elements interact nicely. The whole effect was set off perfectly with the addition of finely chopped shiso which gave a sweet aromatic mint accent. 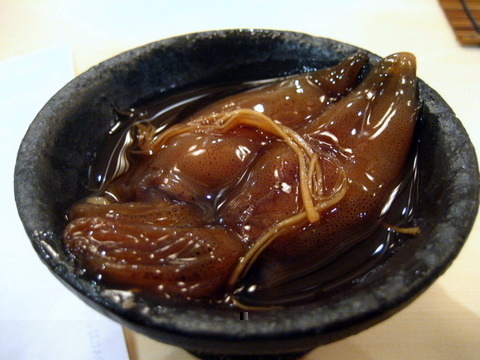 An interesting dish definitely not for the faint of heart, two raw baby squid from Toyama prefecture, dipped in a soy marinade with ginger. Hiro-san instructed us to put the squid in our mouths and add some sake and chew the two together. 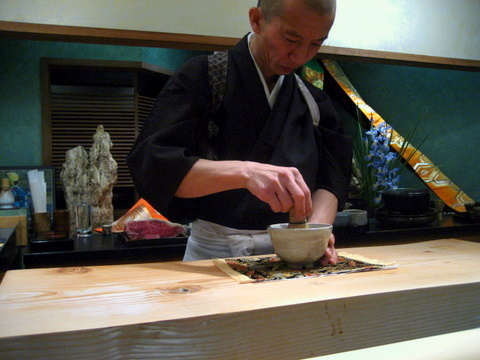 The sake masks some of the stronger flavors of the squid and gives an overall milky sweetness to the dish. I found the texture to be something like a concord grape, where chewing doesn't really break the meat up, it just slides around your teeth. The first bit was slightly marred by a piece of cartilage which felt kind of like chewing on plastic. 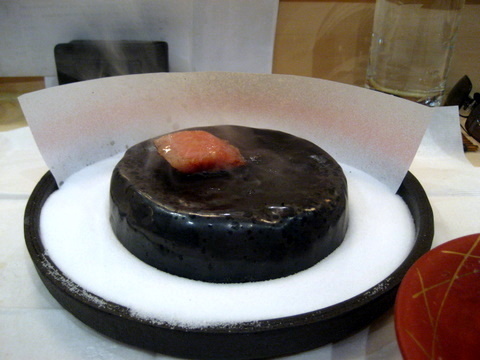 Probably one of the few dishes common in every meal at Urasawa, Sashimi served on a carved block of ice. 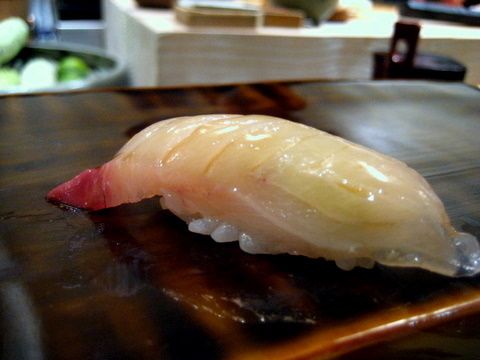 Today we had Toro from Spain, Tai from Kyushu, and Hamachi from Toyama Prefecture. 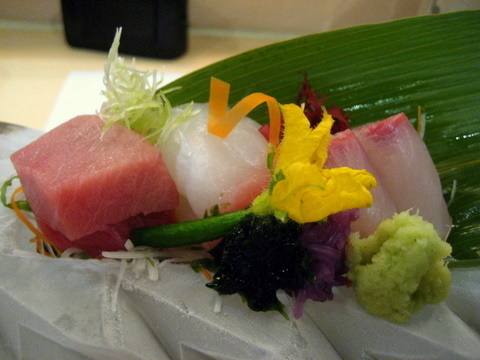 Served with the sashimi were seaweed, red cabbage, and a cucumber flower. 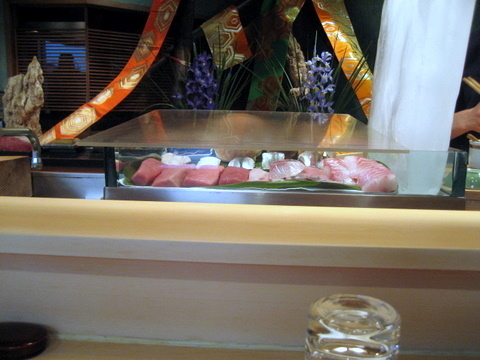 The Yellowtail was firm and crisp very fresh and with less oil than normal. 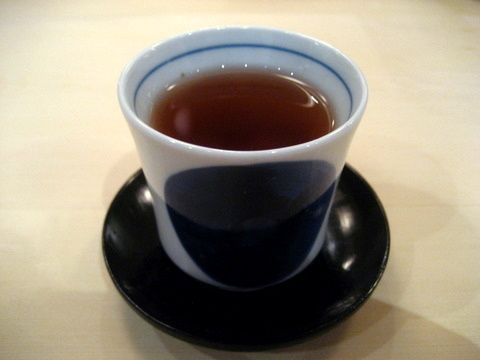 The tai was very soft and had a delicate flavor that was easily overpowered by the soy. The toro was pretty clean at first but as the oils liquefy from chewing becomes flavorful and heavy. Another incredible course. This reminded me of the chawanmushi I had here last time. This dish was composed of mountain potato, sea urchin, shitake mushrooms, snapper, shrimp, eel and ginko. We were encouraged to mix everything together. This was another incredible course. The uni imparted a richness mixed in with everything else, the sweetness was lost which let the savoriness of the entire dish come to the fore. This course combined plenty a complex interplay between the subtle nuances of flavors and textures, and the an overarching heartiness that was consistent in every bite. Hands down the most complex tempura I have ever had, sweet shrimp, uni, black truffle and shiso are all fried together. On the side a clear broth we mixed ginger and radish into. To me this dish initially had a taste of the fried batter similar to many other tempuras. The shrimp and uni were quite good and certainly added their characteristic sweetness to the dish. However the truffle was entirely lost which was a bit of a disappointment. The first of two cooked in front of you courses. Each of us had a napkin placed in front of us to shield us from splashing oil. 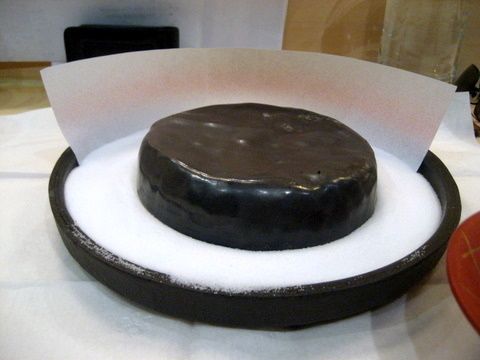 A hot stone was brought out resting in a bed of salt. The heat radiating from the stone was like a physical force. 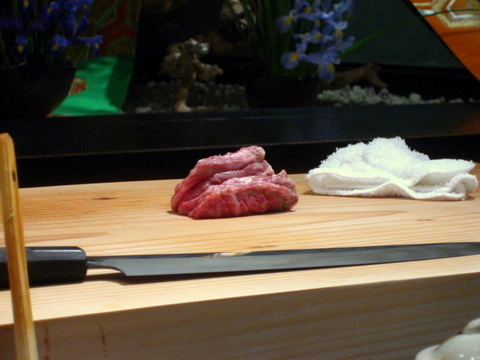 Next two pieces of raw toro were brought out and individually cooked for us. We soon saw the reason for the paper as oil from the fish started flying everywhere and I got a couple painful reminders to stay well away from the rock. 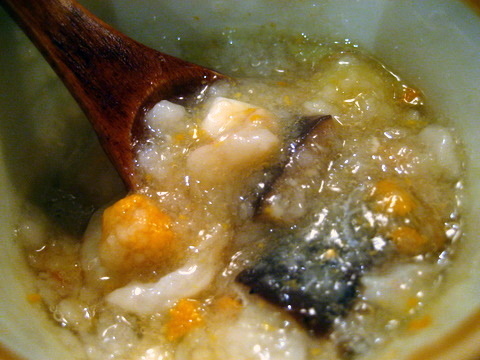 Once the fish was cooked it was placed in a vinegar sauce. The fish itself was quite good, the slightest bit overcooked on the outside, but still raw on the inside with just enough warmth to liquify the fat. The initial flavor was a bit off, perhaps it was the odor of the vinegar, upon mastication, the flavors combine and the vinegar helps keep the fat from becoming overly heavy. Another seemingly constant dish at Urasawa, although the ingredients and stock change each time. This time the stock was a Konbu broth. I thought the mushroom stock used last time was better for cooking but the Konbu broth tasted better when drunk. 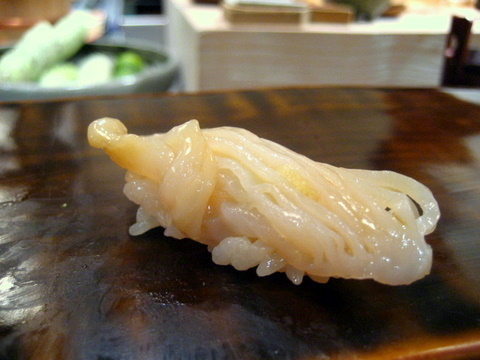 The shrimp were live and prepared for us literally minutes before eating by Urasawa-san and his new assistant, Ken. The sweet shrimp was very good crisp, still semi-raw, the texture became a bit firmer and chewier, something between a shrimp and a clam. 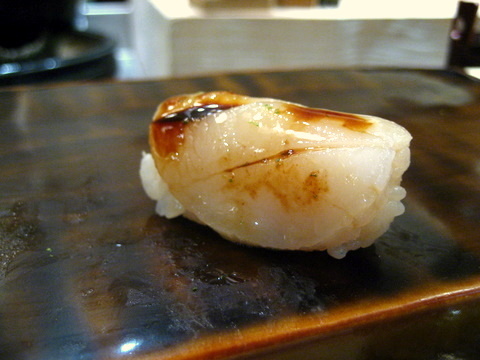 I felt the scallop was the weakest of the four, light soft texture, with the faintest bit of sweetness. The Waygu beef was quite good, a light subtle beef flavor, medium fattiness, lightly warmed to help soften the fats, making the meat more flavorful. Now we come to my favorite, the foie gras. 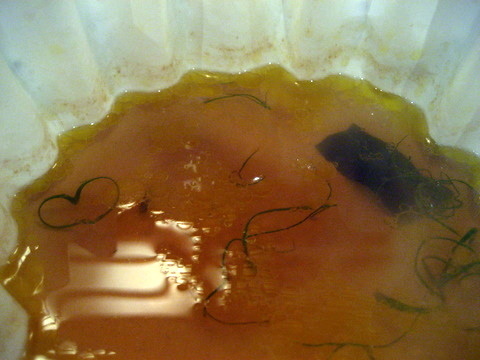 The texture becomes something like jello, soft and saturated with liquid oil and broth. Eating the foie gras releases a burst of rich oil and flavor that I have not found in any other foie gras. The foie gras wasn't quite as transcendent as last time as there was some gristle that added an unpleasant texture and lingering bitterness. 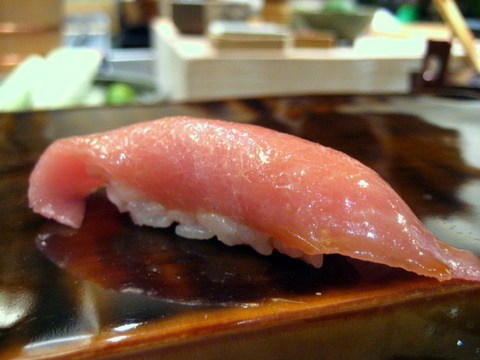 A super soft and nicely marbled piece of tuna, but not so fatty that one feels uncomfortable. 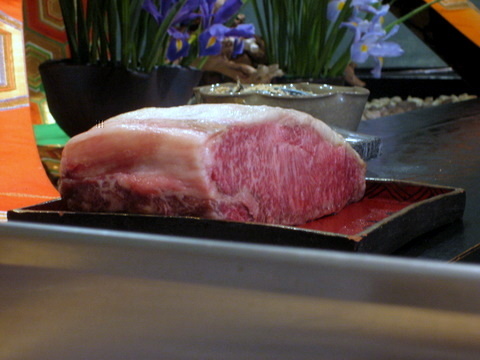 This was a perfectly balanced piece of toro. This was even softer with a beautiful rich silky feel. 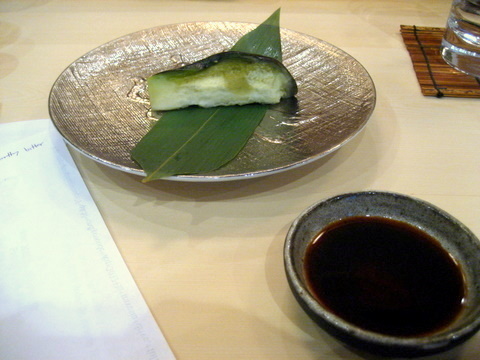 In addition to the oils, the fish had a slight charred flavor and a sweet citrus finish due to the yuzu juice. 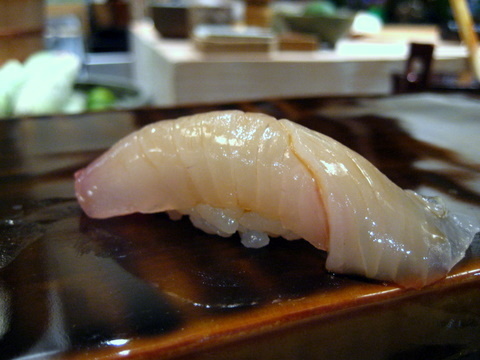 Urasawa-san refered to buri as wild yellowtail as opposed to the farm raised hamachi. 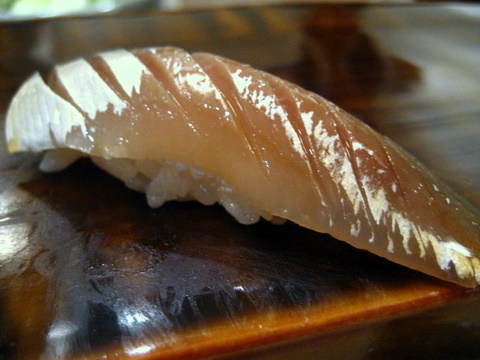 Typically, I find myself unable to decide what type of yellowtail I enjoy most (hamachi, kampachi, or buri). 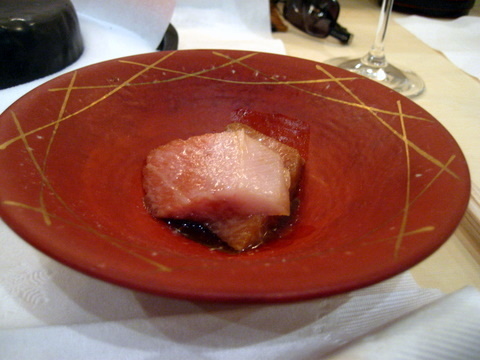 However at Urasawa, the buri stands head and shoulders above, the texture is firm almost crunchy very fresh with a faint whisper of the characteristic oils that give yellowtail its flavor. This tai was also very different from the one served earlier. The other was softer and a bit more flavorful this was much firmer with a cartilaginous texture. I tend to prefer the firmer variation. 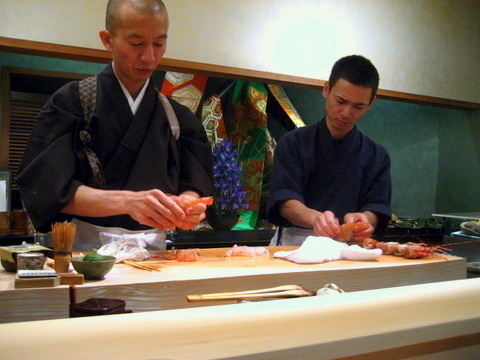 It was interesting to experience both expressions of tai in the same meal. I wonder what differentiates the two, I have heard it was aging, but never asked a chef to verify this. 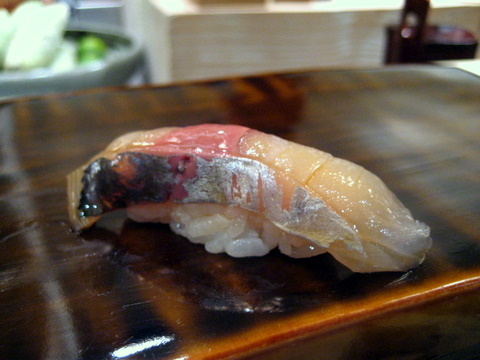 This example of Spanish Mackerel came from Kyushu, yes I am well aware that Kyushu is nowhere near Spain, its just a name. 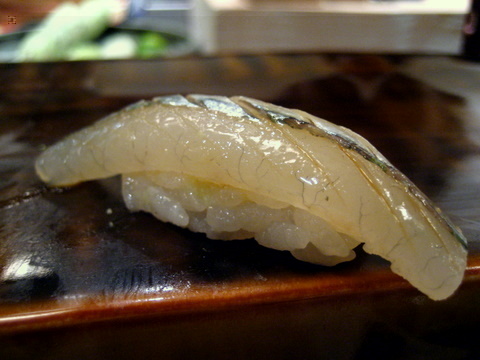 The fis was quite good, firm in texture with a bit of the characteristic mackerel oiliness. 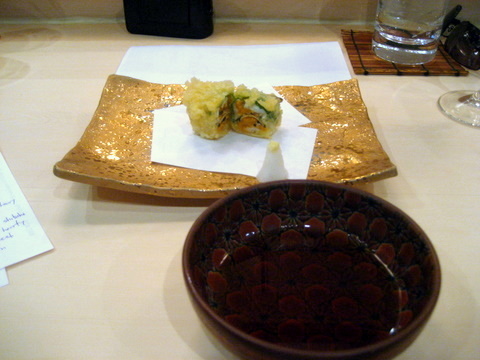 The flavors were nicely balanced with a bit of yuzu juice. This was a brilliant execution of shitake nigiri. Last time I was here I was a bit taken aback we were served mushroom sushi. The mushroom has a nice snap and a flavor reminiscent of sesame and earth, with a hint of bitterness at the end. 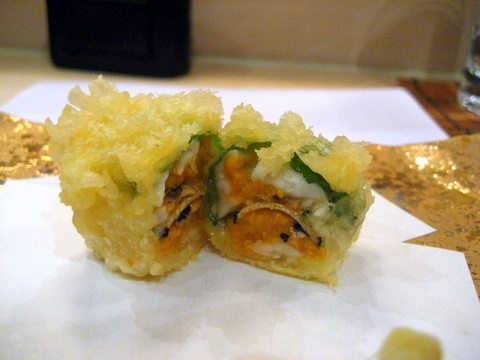 In a departure from the normal gunkan maki roll, this was served without seaweed to hold the uni in place. The flavor was sweet (naturally) with a trace of ocean, very soft with no gristle. 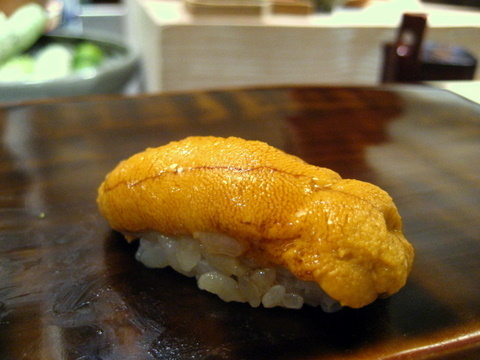 This wasn't the most intensely sweet uni I have ever had but fit well into the theme of the evening. As an example of Urasawa-san's dedication to quality, he tasted a bit of the uni from one box then set it aside and asked for another. He tried the second box then turned to us and said, "This box better, the other one okay but not good enough"
This was a favorite for at least one of my dining companions, the rest all favored some form of toro. The texture was quite complex the connections between the flakes of fish were soft but the meat itself was quite dense. The fish almost had a light sesame flavor under the citrus. 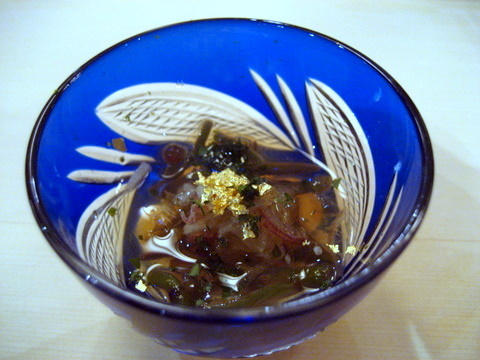 The ika was served with salt, yuzu juice and zest. The texture was soft and creamy, a little bit chewy which added a bit of character to the texture. 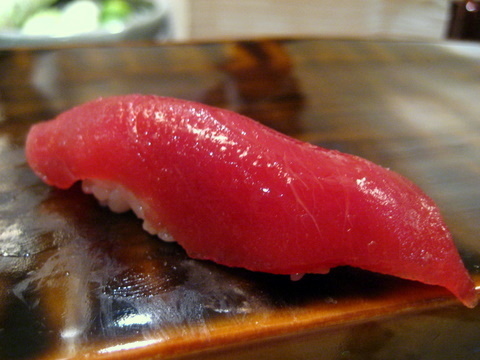 After eating toro eating maguro seems like a bad idea. 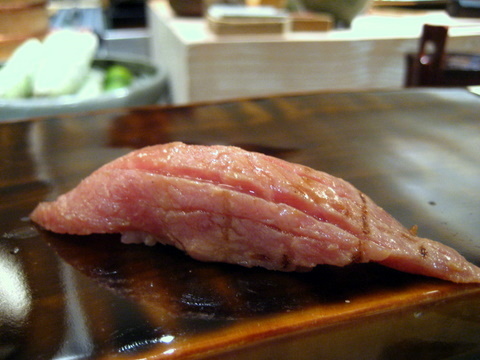 However this isn't your standard maguro, intensely oiled and soft, this was more toro-like than some toro's I have eaten at lesser restaurants. 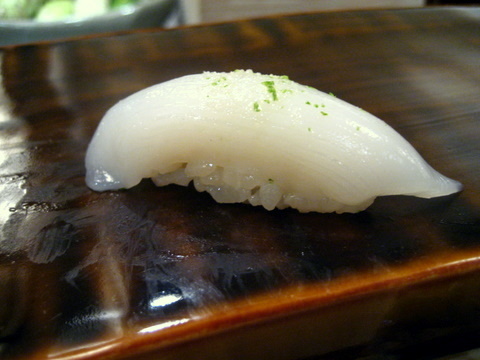 A Chinese favorite, the mirugai had a faint flavor of the ocean and a sort of sweet and tart interplay with a very satisfying dense firm crunch. The awabi had a slightly sweeter flavor and was firmer with a dull flat crunch as opposed to the liveliness of the mirugai. It was nice to have these courses side by side for comparison purposes. Not prepared quite as beautifully as the last time, although the flavor and texture might have been better this time. This was a bit firmer than I recall with a subtle fragrance I can't quite put into words. Another aji course, this time served with kyoto miso, ginger, scallion and shiso. 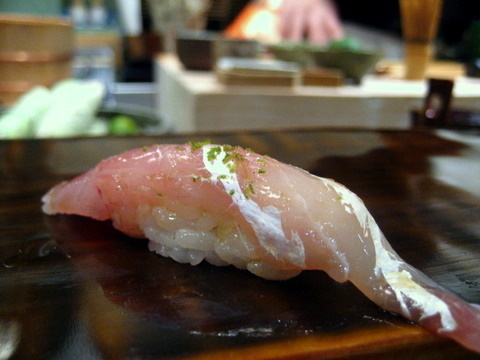 Probably the most complex course, with herbal bitter flavors underscoring the sweetness of the shiso and aji. 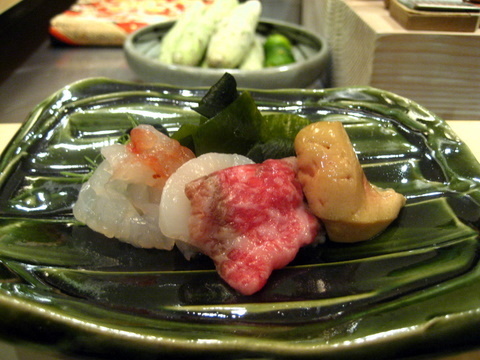 Like the shabu shabu, the shrimp were prepared moments before serving. 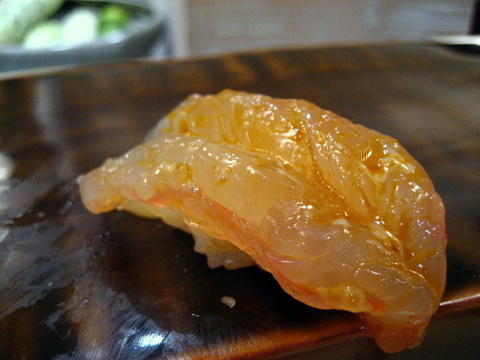 Each shrimp was covered in a mixture of soy and shrimp brain. The texture was phenomenal easily the best I have ever had with the crunch reverberated throughout my skull. The flavor was sweet, but with a strange metallic hint, which was the only thing keeping this dish from being perfect. The entire time Urasawa-san was preparing this visions of delicious fatty beef were dancing in my head. I could hardly contain my excitement as he carefully put each piece on a small grill he had brought before him. 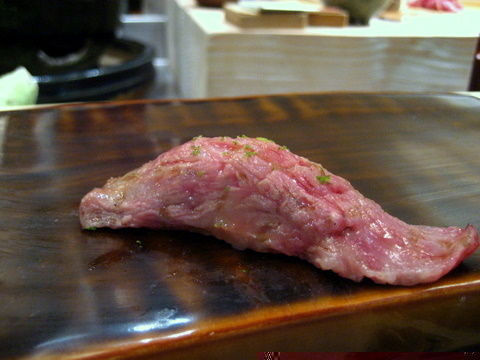 The meat was melt-in-your mouth tender warm and soft. The copious amounts of fat added richness and intensity rather than overpowering the natural flavor. The last of the fresh scallops this was served with what Urasawa-san jokingly referred to as chocolate sauce, really it was eel sauce. Although my mind did play a trick on me and I swear there was a hint cloying sweetness I felt reminded me of fudge. 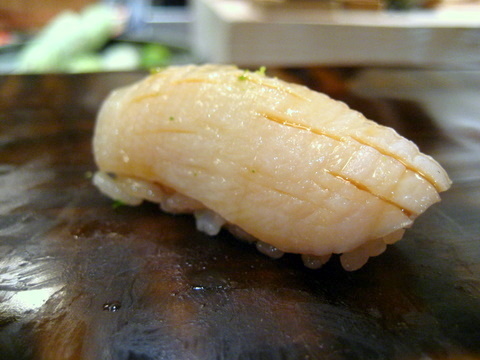 As Urasawa-san told us last time, the quality of a sushi restaurant can be determined by it's tamago. 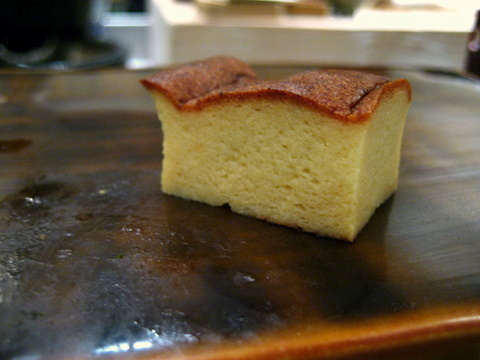 The first time I tried the tamago was as close to perfection I have ever found more like a cake than an egg. This one was quite similar but a little denser less spongy and maybe a touch less sweet. I preferred my first experience but I'll gladly take my second any day. 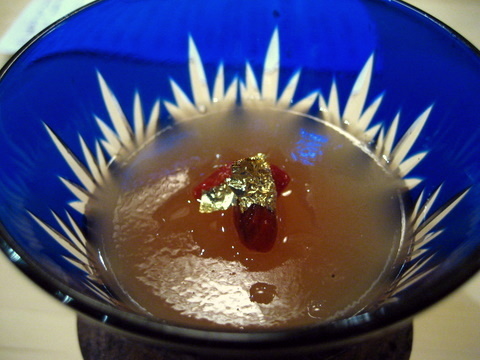 This was served with bits of gold leaf and goji berries, with fresh grapefruit underneath. The geleé was cool and refreshing, the bitter citrus cleaning away the last lingering vestiges of the fish. The bits of grapefruit were even colder and popping the bits released a cold sweet explosion of flavor. As an intermezzo this course can compare favorably to anything I have ever had before. 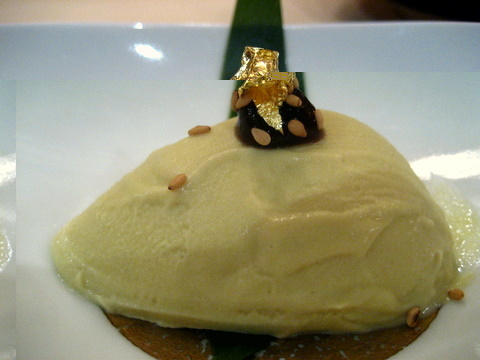 A dessert Urasawa-san said was very popular with Chinese people, home made sesame ice cream topped with white sesame red bean and gold leaf. 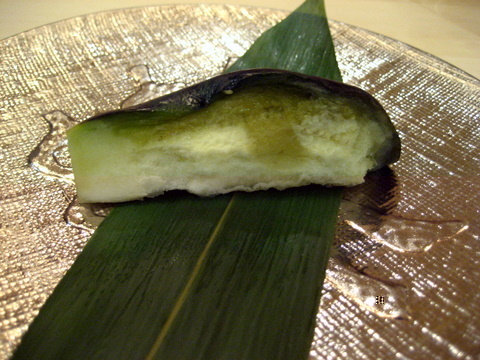 The ice cream had a super-concentrated flavor of sesame with the dollop of red bean paste adding an intense sweetness. 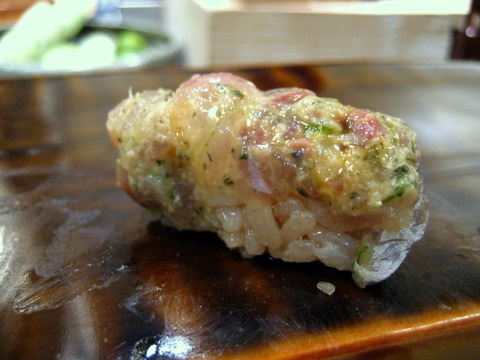 Initially the texture was very hard almost to the point of being difficult to eat. Once it warms up the ice cream is rich and creamy with a bit of grain at the end from the sesame. 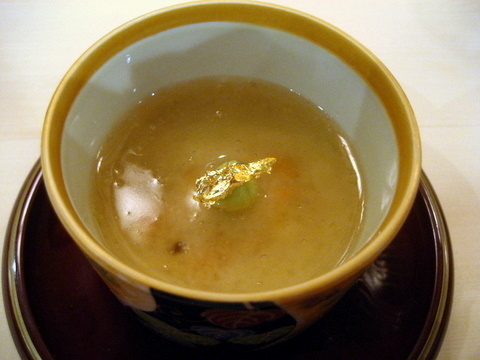 A thick strong green tea similar to that served at tea ceremonies. 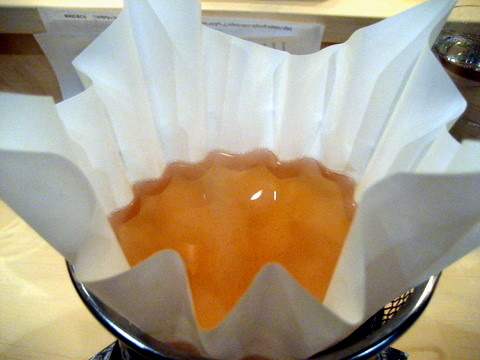 The top is foamy and creamy but underneath the tea is actually fairly clear. The flavor is somewhat bitter, tempered with a green fresh flavor. 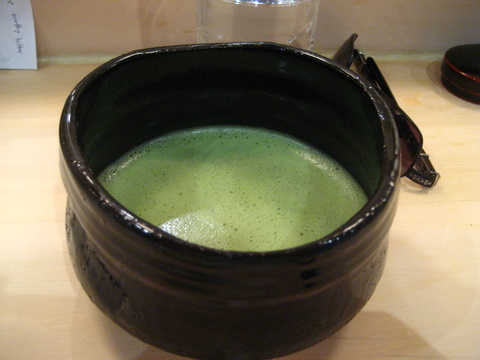 A roasted green tea that to me had hints of barley or a similarly bittersweet flavor. I believe like coffee, the roasting of the tea increases the bitterness, which was a very nice way to cleanse the palette at the end of the meal. We actually all drank multiple glasses as we sat and chatted with Urasawa-San after the meal. Passion for what you do was a recurring theme for the night's dinner. 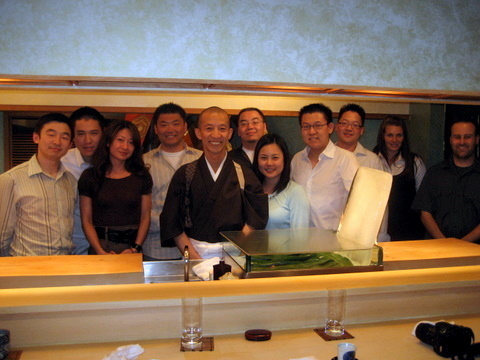 Urasawa-san spoke solemnly about the passion and heart he learned working at Ginza Sushi-ko. 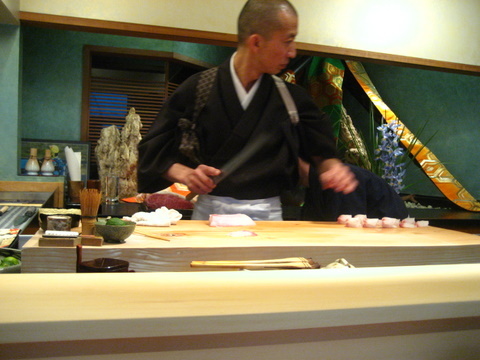 Passion is why he will always be behind the counter of his restaurant and why he will never have his own empire. Truly it is a joy to watch him work, to say nothing of sampling the results. Respect for the food and its creator is the reason for the departure from my normal review style. 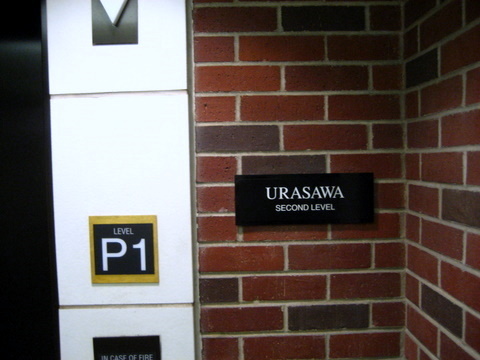 This trip to Urasawa was especially exciting for me. My friends and I gathered a large enough group to book up the entire restaurant. There is something nice about having the entire restaurant to oneself. 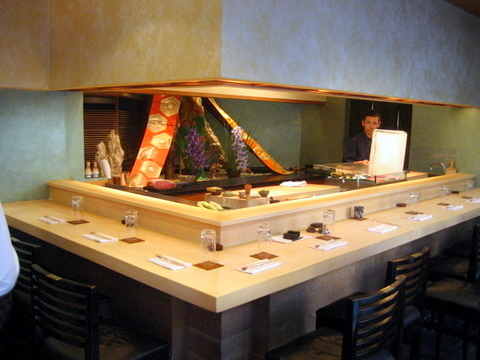 Surrounded by friends and and affable chef it is easy to relax and enjoy the experience fully. When we arrived we had about 15 minutes to relax. 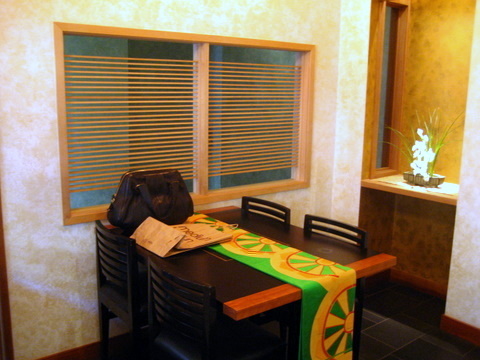 We snapped some shots of the restaurant and talked with the staff. Naturally a meal like this, food is king, and wine is a peripheral concern at best. 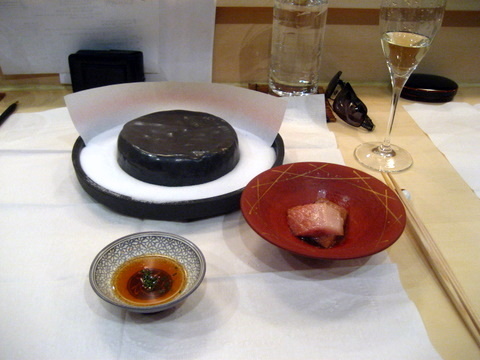 We started with a bottle of Kubota Mangyu which we enjoyed through the first few Kaiseki courses. We also enjoyed a magnum of 1999 Dom Perignon which I thought a bit sharper than my previous experiences. I really enjoyed the 2000 Cristal which had an intense fruit and floral nose. On the palette the wine has a rich texture, combining a roundness with a sense of freshness and energy. Those of us returning for our second trip noticed the staff had changed. His new assistant is named Ken and is actually his brother-in-law. We asked one staff member what happened to Sung, Urasawa's previous assistant and we were told Sung had left the a few months back and had gone to French Laundry after a two year stint at Urasawa. When we asked Urasawa-san about Sung's departure he had nothing but praise for his former assistant. Saying of the many chefs that he has worked with, Sung is one of the few that has what it takes to be a great chef and the move to Laundry would be a great experience and provide the tempering. He also mentioned knowing Corey Lee, head chef at French Laundry, I wonder if Urasawa-San spoke with Corey to help Sung, then again having Urasawa on your resumé should say plenty already. 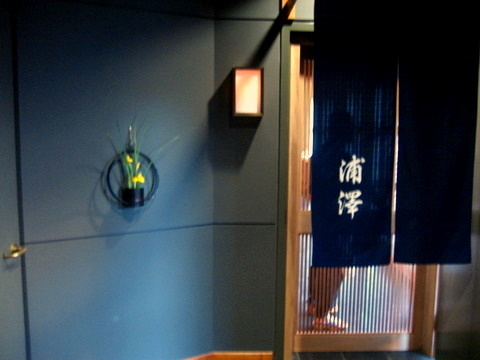 Throughout the course of the evening Urasawa-san's connection to great chefs throughout the area and his general knowledge of other restaurants became apparent. At one point we talked about the 5x5 collaborative dinners and he mentioned being invited to dine at Melisse's last year. When we told him Bastide had dropped out he immediately knew it was because Walter had left. In fact, he had talked to Walter after it happened and recommended him as a guest chef at Breadbar. Of course he still keeps in touch with his former sensei Masa Takayama and laughingly remembered that Lawry's was Masa's favorite restaurant when he was in LA. When we talked about restaurant recommendations he suggested Comme Ça. When asked what kind of food he liked he said Chinese food since his father ran a Chinese restaurant. Urasawa-san was born to be in a kitchen, working first at his father's restaurant for $.25 a day and later forgoing schooling to follow his passion. Some of my friends and I have been looking for a good Chinese restaurant for the trifecta of Chinese food. He recommended Capitol Restaurant for dinner and Sea Harbor for Dim sum. In turn, he asked what restaurants we enjoyed. When I mentioned my favorite French restaurant was Robuchon he said the restaurant actually loses $1 million a year as their food costs account for 70-80% of their revenue, but that the restaurant remained open to pull people into the casino. At some point, the conversation turned onto the topic of Japan. 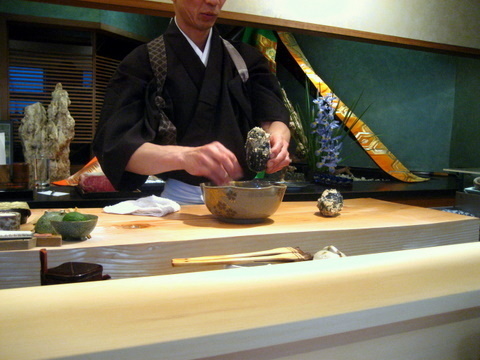 One of my dining companions recently went to Japan and ate at Kaji in Kyoto. Urasawa mentioned he was friends with the owner Kaji, and was surprised my friend went to the restaurant as it was so small. 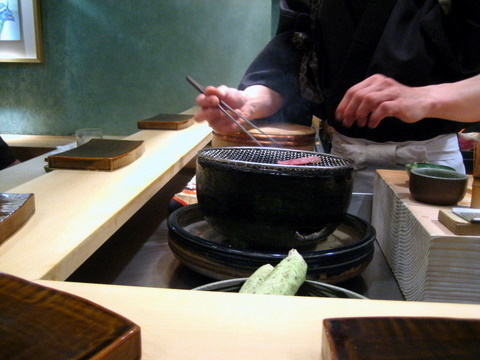 Urasawa said he has not been to Japan in years as he cannot really afford to close the restaurant for so long. In fact he closes Sunday and Monday because the quality of the seafood is not up to his standards (fish markets close on Monday). His only vacation comes January 1 to 7, not enough time for a trip back home. However his mother does come to visit occasionally and has been known to bring ingredients he cannot get here. At one point I asked if Urasawa ever thought about opening a new restaurant, but he said he couldn't control the quality if he wasn't directly involved. For him, it's not about the money thats why there will never be a family style Urasawa, or an Urasawa to-go. 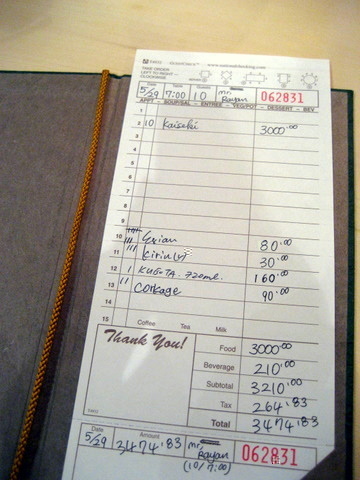 In fact Urasawa-san said the restaurant doesn't produce too much profit. 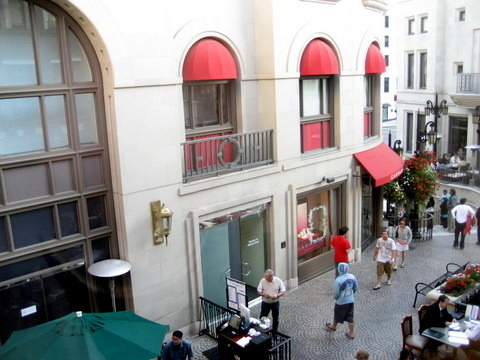 Easily believed given its prime real estate on Rodeo Drive and the fact that at most he can serve 14 people a night. Our night ended about 4 and half hours after it began. Urasawa graciously posed for a picture with us before calling it a night. Begin with passion end with passion, Urasawa-san's passion and love for his work shines through in every course he creates. Urasawa-san as long as you love what you do, I'll be there to passionately eat the results.